Home to wonders like its open prairies and the Black Hills National Forest, the Mount Rushmore state is certainly an inspiring place to own a home. Mortgage rates in South Dakota are lower, sometimes significantly, than the national average. The state’s conforming loan limits and FHA limits stick to the standards. South Dakota is larger than more than half the states in the nation, but it’s also one of the least populated. South Dakota mortgage rates are historically below the national average. If you are planning to buy a home in the Mount Rushmore State, you will want to set a budget before you embark on your search. It might also be a good idea to consider getting mortgage preapproval from a lender, which can help to streamline the homebuying process. The conforming loan limit in every South Dakota county is the standard $453,100. FHA loan limits are also consistent at $294,515. State law mandates that a seller must provide a buyer with a disclosure form. The South Dakota Department of Labor and Regulation provides a comprehensive disclosure form, which includes details on known defects, items included in the sale, environmental hazards like mold, structural damage and potential liens on the property. Regardless of the law, a buyer should always schedule a home inspection to protect the integrity of the sale and uncover any hidden defects. If you’re settling down in the Mount Rushmore State, a 30-year fixed-rate mortgage is likely going to be an option you explore. The interest rate for this home loan option does not change for the entirety of the loan’s life, unless you refinance. With a 30-year fixed-rate mortgage, you know exactly how much your monthly payments will be, which makes it a bit easier to budget. The average South Dakota mortgage rate for fixed-rate 30-year mortgages is 5.0%. Each state has its own set of conforming loan limits to help lenders assess financial risk. If a home loan goes beyond the limit in a particular county, the loan is considered a “jumbo loan.” These outsize loans are riskier for lenders as more money is stake. In order to compensate for that added risk, jumbo loans have higher interest rates. In South Dakota, the conforming loan limits stick to the standard $453,100. This is an indication of the relative affordability of homes in the state. If you take out a home loan that’s more expensive than $453,100 anywhere in South Dakota, you’ll be taking on a jumbo loan. The average jumbo loan rate in South Dakota is 4.3%. Adjustable-rate mortgages (ARMs) stand in contrast to fixed-rate mortgages in the sense that they have an interest rate that will change over the duration of the loan. An ARM will offer a lower interest rate for a set period of time between one and 10 years. When this introductory period comes to an end, the interest rate may increase or decrease but, as you might expect, it usually goes up. It is important to note that there is a cap on how high the interest rate can go on a particular ARM. This cap will be listed in the loan’s terms and it is critical that the buyer assesses the maximum potential interest rate and ensures that it’s one that they can actually afford. The average rate for an ARM in South Dakota is 4.4%. Buyers in the Mount Rushmore State can reach their homeownership dreams with the help of resources available throughout the state. First-time homebuyers in South Dakota are eligible for low interest fixed-rate mortgage loans and cash assistance to finance their first home. They can also apply for the SDHDA mortgage tax credit, which reduces federal income tax and puts more money back in the buyers’ pockets. For eligible repeat homebuyers, the SDHDA provides loans with low fixed rates, down payment and closing cost assistance and reduced mortgage insurance. The Community Home Improvement Program offers low interest loans for eligible low-income applicants to improve or repair their homes. GROW South Dakota can aid SD homebuyers in down payment and closing cost assistance, homeownership education, weatherization assistance to help make homes more efficient. The Dakota Dream Savings Fund matches a buyer’s savings of up to $2,000 with $3 for each saved dollar. With that program, a buyer could end up with a total of $8,000 toward their new home. The United States Department of Agriculture Rural Development program offers financial assistance to residents in rural communities across the nation. Qualifying applicants in South Dakota can access loans and grants to put toward the purchase of a new home. 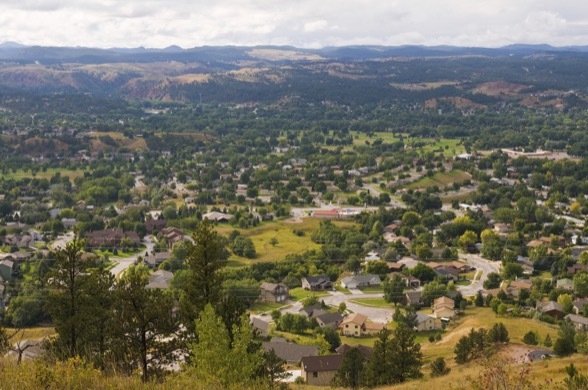 South Dakota charges transfer taxes on real estate, so be prepared for that if you’re selling as sellers typically pay this fee. The transfer tax is $0.50/$500, or 0.1%. Homeowners across the U.S. are allowed to deduct the mortgage interest that they pay throughout the year from their taxable income when they file their federal income tax returns. Are you a South Dakota resident looking to refinance? Try getting in touch with your state’s Home Affordable Refinance Program. The South Dakota HARP accepts single-family homes and condos, and qualifying owners will have access to payment reductions and low closing costs.